In the early part of the last century, our grandparents were taught that the world was made about 4004 BC, as that was the date determined by a Bishop Usher who had counted the generations from the first man, Adam, to the birth of Christ! In the famous Scopes (evolution) trial in the 20s, the well-known orator/lawyer, William Jennings Bryan, vehemently defended the beliefs expounded by the bishop. The opposing lawyer was Clarence Darrow, who cited Darwin’s discoveries; much to the dismay of the fundamentalists, the young biology teacher was given only a light fine. His students celebrated. Many ancient beliefs still affect society; some may be genetically inherited, but most remain in our modern methods of communication: our languages, the (commercial) media, and electronic. Let’s take a quick look at the history of languages. 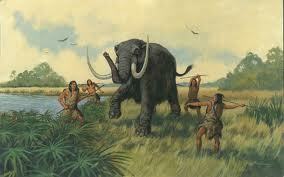 When the primitive man slew a mammoth, he immortalized the deed with a sharp piece of flint on the walls of his cave that others might know of it. Picture writing by the ancient Egyptians was not only scratched on walls but inked on parchment–the dried skin of sheep, goats or lambs). The crude, but identifiable symbols were organized on lines. Cuneiform was developed by the Assyrians, Babylonians and Persians to make many words out of the same simple wedge-shaped marks. The Greeks, however, created an alphabet of 24 characters from which thousands of words could be made. Alpha, Beta,….you see how easy it is to make words! Languages themselves are constantly dynamic, depending mainly on the mobility of people due to simple technology. The ancient Greek population covered dozens of islands without sufficient arable land. They traded with mainlanders for crops, using sailboats as did other Mediterranean countries. Remnants of languages were exchanged particularly due to the universal practice of slavery. The Roman Legions not only raided their neighbors in Italy but throughout “Mare Nostrum” (our sea, the Mediterranean) and a large part of Europe, including Britain. The principal booty brought back to Rome by the triumphant legions was thousands of slaves; the most desirable were chosen by the emperors and their cohorts. Sturdy slaves became field workers; rebellious ones were sent to the triremes (warships with three banks of oars) or the coliseum to combat with wild animals for the entertainment of the populace. There are many similarities between Roman society and ours. The free population of Rome contained two elements: patricians and plebeians. The former enjoyed all political privileges; the latter were underprivileged, perhaps from other countries and races. Some placed themselves under protection of rich clans or the government itself! The patrician classes dominated the government and were mostly property owners. The classes were seated separately at the circuses in the coliseum. Wild animals were brought from Africa for various events. In vicious violence some could only be surpassed by modern television! Criminals and people of other religions were main events. Throughout the centuries, historians rarely condemned the depredations of the Roman legions for their brutality. The acceptance of tribal rivalry and political boundary lines resulted from an indoctrinated belief in “the divine right of kings”. Our docile toleration of increasing social evils in our status quo stems from the repetitive inculcation of the patriotism of politics in our schoolbooks and various media. (Remember Pavlov’s dogs?) Behavior patterns for thousands of years have been imposed by politics and sanctified by religions, and serious consequences resulted from non-observance. For centuries churches attempted to indoctrinate morality with orthodox religious beliefs. In hundreds of towns, they were the centers of community activity. Today the masses of people attend ball games. The franchises for commercial sports teams run into hundreds of millions of dollars. The sports world is no longer limited to college competition. Prize fights, once bare-knuckled affairs, are also money dominated, as are track and racing events. The behavior of coliseum crowds is fascinating; they are vicariously involved with the contestants; many experience orgasmic enthusiasm. Just like the ancient Romans! The sophistry of our venal politicians assuages the doubts of most of our citizens concerning our economy to restore confidence in our fiat money by increasing government spending (and debt creation). This is the bread in the bread and circuses nostrum to postpone fundamental social change. Today we all play “money games”; our “leaders” protect the status quo. We build coliseums and go into debt. Investigate Technocracy, an exciting new idea for the social operation of North America by technology under the direction of science.